As I’ve mentioned before, I’m splitting my time between CityScape Battle and Pow Pow’s Mini-Golf Deluxe. 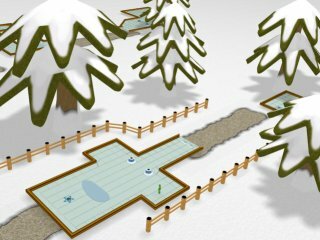 This past week I’ve been working furiously on Mini-Golf Deluxe. I’ve begun work on one of the two new courses. One of the new courses will take place in the snow. All the putting greens are completed and now I’m just working on modeling the rest of the course objects and terrain. Here’s an early render of the course. You are currently browsing the Outside the Box Software - Game Development Diaries weblog archives for July, 2006.